If there’s one thing Apple knows how to do, it’s build serious hype. The launch of the second generation iPad, much like the iPhone 4 and the new Macbook Air and the first generation iPad before it, generated a flurry of online speculation in the days leading up to the event, with bloggers and tech journalists racing to weigh in with their predictions. 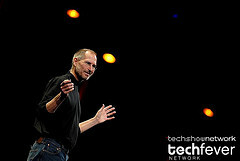 The excitement factor of the keynote itself was given a boost by the unexpected appearance of Apple CEO Steve Jobs, who was widely predicted not to attend due to his ongoing ill health. Jobs implicitly slammed his competitors, dubbing 2011 “the year of the copycat” – companies including Motorola and Dell have recently launched tablet devices aimed to rival the first generation iPad. Even after the details of the iPad 2 were unveiled, Jobs’ appearance remained the biggest surprise of the day. A redesign was predictable, a camera inevitable (it could, and should, have been included in the original iPad), and the extra apps are useful but hardly ground-breaking. For me, the most exciting new feature is also one of the less discussed, the pretty-yet-practical Smart Cover. This is a genuinely fresh add-on, rather than something we’ve seen before in smaller form on the iPhone, and it improves the iPad’s functionality in an immediate, definable way. The magnetic cover snaps to the iPad’s screen to protect it from wear and tear, and when lifted it can be folded back to form a stand that holds the iPad upright, like an easel, or at a slight tilt like a keyboard. Simple, but brilliant. – A slimmer, lighter design. The device is billed as 33 per cent thinner than the original ipad, weighing in at 1.2 pounds compared to the original 1.5. For journalists on the go, who (since the upgrade did not include the much-hoped-for USB port) will likely also need to carry a laptop with them, this is a definite plus. – Front and rear-facing cameras, plus Face Time for video chat. The iPad screen lends itself better to face-to-face conversations than the iPhone’s, and it’s far less unwieldy to carry around mid-flow than a laptop, so it’s easy to imagine this as a handy, portable alternative for long distance interviews. – A new dual-core A5 processor, which translates as a processor that operates twice as fast, and renders graphics several times as fast, as the first generation incarnation. – Several new apps that previously weren’t available on the iPad, including iMovie and Garage Band. The full list of iPad 2 features can be found here. The iPad 2 will go on sale in the US from March 11, and in the UK from March 25. UK customers can register to be notified when pre-orders are available. Prices will remain the same as for the iPad 1, which means £429, £499 and £599 respectively for the Wi-Fi only model, and £529, £599 and £699 for the Wi-Fi + 3G model. It’s been confirmed that Orange and T-Mobile will stock the iPad 2, while O2 won’t sell it directly but will offer data packages for the device. Depressed by grainy, pixelated cameraphone photos? Fantastic shots are possible, check out these beauts.